Now that the weather is cooling down and we’re getting splatters of rain and a chill on the wind, it’s obvious that (as Jon Snow would put it): winter is coming. But there’s one thing that keeps us Aussies warm through the colder months: It’s the AFL season! This season, we continue to cheer on our favourite team, The Hawthorn Football Club, as they go for their third consecutive grand final win. Hawks fans will be treated to exclusive behind-the-scenes episodes featuring their favourite past, present and future Hawks champions. When you subscribe to the iiNet Eye on the Champs series you‘ll have each episode sent direct to your inbox. You’ll get to know players more intimately as they share their hobbies and passions outside of football, giving you a whole new window into their lives when they’re off the field. Episode one showed us the soft and charming side of Josh Gibson. 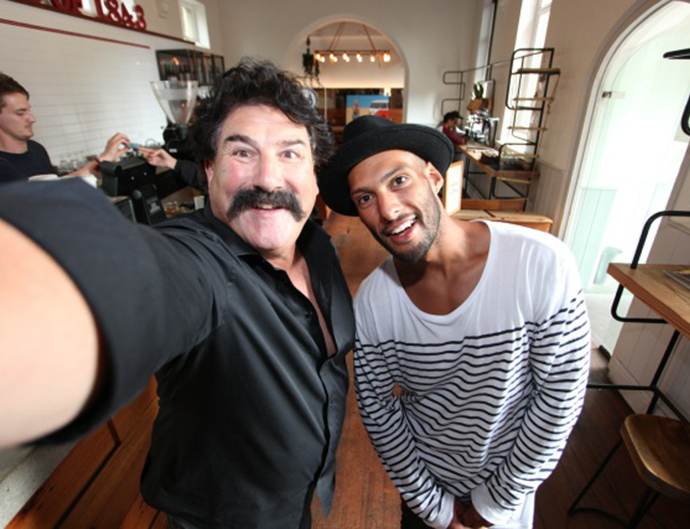 His brown and gold footy jersey had been swapped for a comfy black and white striped sweater, black slacks and feathered fedora as he takes fans on a tour of the café he is a partner in. As the son of a Barbados man, he grew up eating some pretty interesting food himself: including chillies so hot they’d “blow your head off”! Eye on the Champs also gives you the chance to get involved by using the hashtag #playlikeachamp across social media including Facebook, Twitter and Instagram. We encourage fans to share their own passions, football or otherwise, with the chance for their photos to be posted on the official Eye on the Champs website. Fans can share their passion for footy by posting pics of their pre-game rituals, hanging out with friends and family at the game, or barracking for the Hawks. But don’t stop at footy, we want to know all your passions and hobbies: perhaps you are legend on the guitar, a whiz in the kitchen or a flash dancing maniac on the floor! Just snap a pic and throw up the tag on your platform of choice. We band together for our teams, proudly belting out their songs, celebrating their wins and mourning their losses as one. Now more than ever, the internet and social media create a great opportunity for fans to connect better with their favourite sports teams and we’re stoked to provide this opportunity to Hawks fans! Attending the Hawks’ home games in Melbourne? Grab some iiNet Thundersticks to show support for your team and you could win a chance to hang out in the iiNet Champions Lounge where you can watch the game in comfort, with complimentary catering, and in the special company of a past Hawks champion! Our round one winner got the chance to chill with Robert “Dipper” DiPierdomenico. Stay tuned over the season, as the Eye on the Champs continues to roll out! There’ll be loads more exclusive content including teasers, new champions, hilarious outtakes, and the chance to share your experiences. Why the hype about the AFL? Ultimately the customers of iiNet pay for it whether they like footy or not. The financial support for players of sport is not justfied. Apart from earning amounts well in excess of the average australian there is no valueable productive output as a result other than entertainment and a continuous after/before/ater the gaim discussion/speculation on commercial tv. That’s where the money finishes up eventually. How about discounts for those who are not interested in footy?